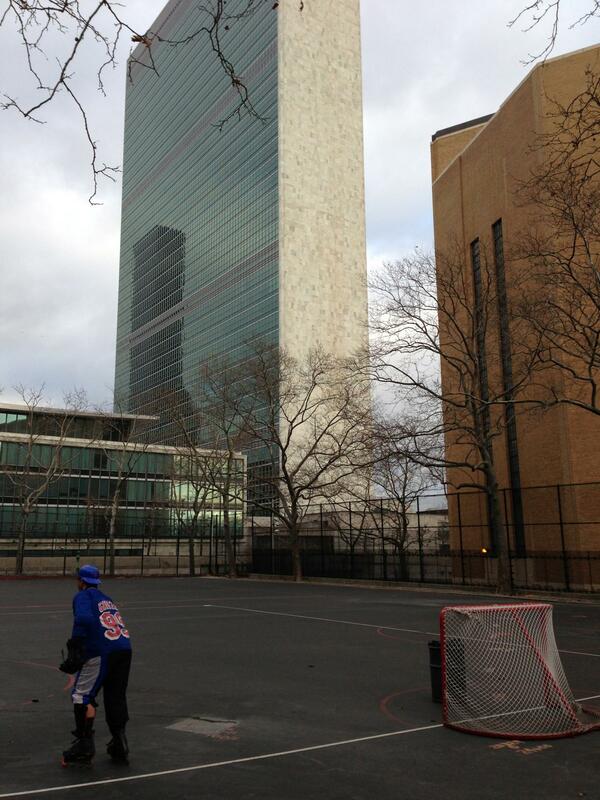 Providing Organized Roller Hockey in NYC for over 40 years! 1937 - NYC purchases city block- 42nd Street to 41st Street - 1st Avenue to FDR Drive from NY Edison Co. for the building of the Midtown Tunnel Ventilator Building. The area to the east and west of the building is planned as parkland. 1941 - 42nd Street (Robert Moses 1982) Playground established. 1972 - East End Hockey Association - Roller hockey program begins a Roller hockey for youth program. 1979-1981 - The Tudor City Swap. Harry Helmsley attempts to extort the 42nd Street Playground from NYC in exchange for his agreement NOT to build on the Tudor City Parks. 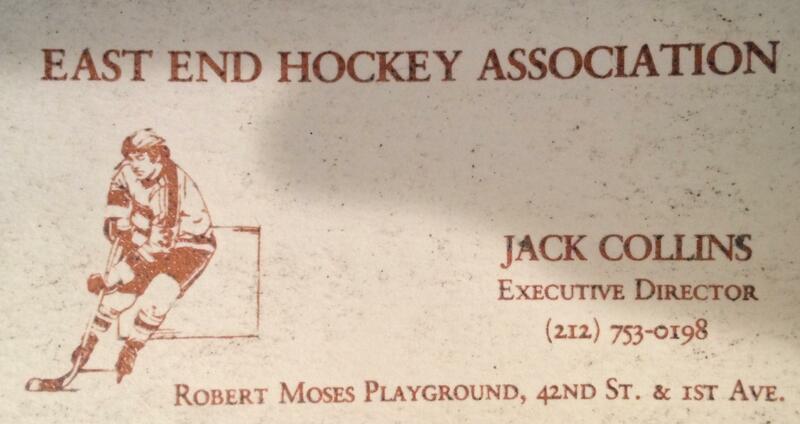 1980 - East End Hockey writes to former Parks Commissioner Robert Moses for his support to save the playground. He responds with a letter of support that proves to be a turning point. March 1981 - The Tudor City Swap is defeated at the Board of Estimate. 1982 - The 42nd Street Playground is renamed in honor of Robert Moses. 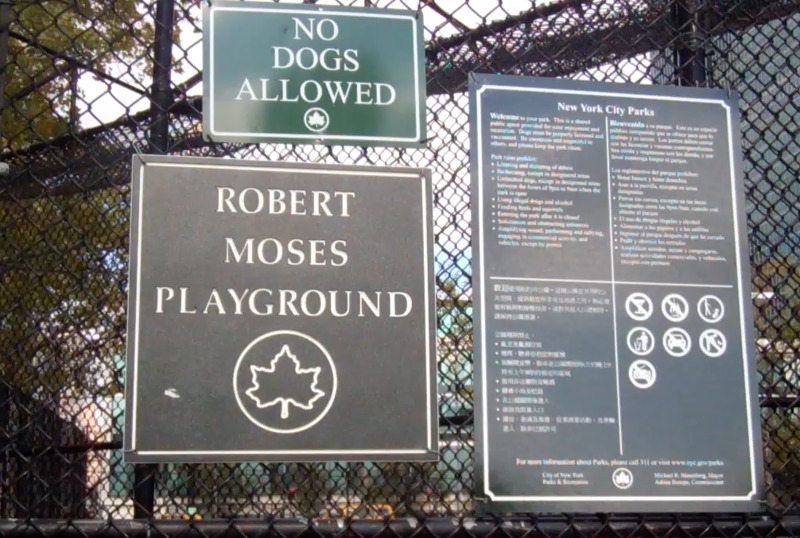 It is now the Robert Moses Playground. 1983 - The playground is resurfaced with the direct assistance of Parks Commissioner Gordon Davis. 1993 - The Robert Moses Playground is resurfaced with funding from Council Member Carolyn Maloney and the assistance of CB6 Chair Jane Crotty. June 1997 - UN's Rio Plus Five Festival in the playground leaves 66 divots (holes) in the surface of the playground. The event featured festival tents with poles. The poles made holes in the surface of the playground. Feb. 2002 - East End Hockey requests a resurfacing of the Robert Moses Playground. April 2002 - Lois Weiss, real estate writer for the NY Post reveals that the UN wants to destroy the Robert Moses Playground with an office building in order to restore the UN's Secretariat building. November 2002 - Roy Goodman presents the idea of taking the Robert Moses Playground to repair the Secretariat building. Feb. 2003 - The first formal presentation of the taking of the Robert Moses Playground. May 2005 - Con Edison does exploratory work, digging into the surface of the playground as they check their former property for pollution. They do an excellent repair of the affected areas and restore the playground sections as required. 2008 - UN begins repair of Secretariat building. 2009- Late February - Unannounced, Department of Parks and Recreation puts tar on the cracked surface of the playground. The affected areas are in the center of the playground, running north to south - 42nd Street to 41st Street. They create a tripping hazard because the tar melts into the cracks, so the crack is still there but now there is a border of tar on either side of the crack. East End Hockey refers to this effort as "the scar of tar." 2010 - The playground continues to erode. Liability is question. Send us an email with your questions or comments. You can also leave a message at 212-753-0198.